Welcome to Mackay Bridge Club. 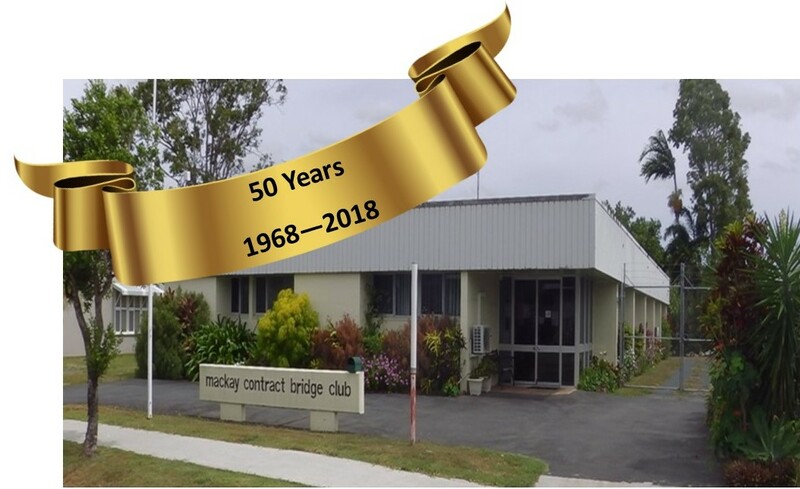 A bridge-playing group began in Mackay in 1949 although the first formal meeting of the Mackay Contract Bridge Club was not held until Friday 14th June 1968 at which time it became a member of the Queensland Bridge Association (QBA). The club was formally incorporated on 10th June 1986. Mackay Contract Bridge Club Inc is located in Mackay, Central Queensland. Mackay is on the Whitsunday Coast, and is one of the closest regional centres to the Whitsunday Islands of the Great Barrier Reef. We are a non-profit organization reying on members for financial support through its annual membership levy and table fees . We welcome players of all levels and experience. The Club is air conditioned and maintains a library, runs teaching classes and encourages an interest in administration and directing of competitive events. We rely on the voluntary efforts of our members for all administration, housekeeping, scoring and directing. We run 7 sessions a week, including one supervised play session. We welcome all visitors to our club. If you're visiting our region and would like us to find you a partner, call our partner organiser. The Club is affiliated with the Australian Bridge Federation (ABF) and participates in the Master Point scheme. Players obtain higher rankings according to their achievements at the table. The ABF provides a subsidy for a Central Queensland team to play in the final in Tweed Heads of the Grand National Open Teams. The Queensland Bridge Association provides subsidies for Central Queensland players to attend the State Pairs and Teams Championships in Brisbane, and also subsidises visits by Queensland and International bridge teachers and directors. Mackay Bridge Club is also host once every four years to the Barrier Reef Congress. This event alternates between Mackay, Yeppoon, Townsville and Cairns and is next scheduled for Mackay in 2021 (Special arrangements). This is a gold-point event, attracting players from all over Australia and overseas.